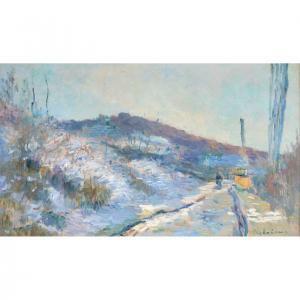 Find artworks, auction results, sale prices and pictures of Albert Lebourg at auctions worldwide. 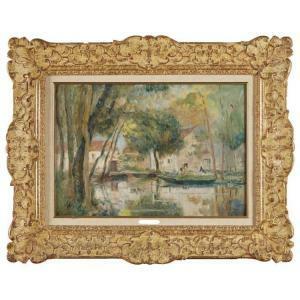 ALBERT LEBOURG (1849-1928) Les Étangs à Mortefontaine en automne signed 'a. Lebourg.' (lower right) oil on canvas 39.5 x 72.2cm (15 9/16 x 28 7/16in). Painted in 1894 Footnotes The authenticity of this work has kindly been confirmed by Monsieur François Lespinasse. Provenance Arthur Tooth & Sons Ltd., London, no. 3582. Private collection, UK. Thence by descent to the present owner. **Albert Lebourg 1849-1928 (French) Landscape with river reflecting the houses oil on canvas h:38 w:55 cm. signed lower left Provenance: Acquavella Galleries, New York. Collection of Charlotte Wright., acquired directly from the above in 1968. By descent in the family. Collection of Dorrance H. Hamilton. Description: ALBERT LEBOURG (french 1849–1928) "PAYSAGE RIVIÈRE" Signed 'A. Lebourg' bottom left, oil on canvas 15 x 21 1/2 in. (38.1 x 54.6cm) provenance: Acquavella Galleries, New York, New York. Acquired directly from the above in 1968. Collection of Charlotte Wright. By descent in the family. Collection of Dorrance H. Hamilton. note: French artist Albert Lebourg (né Albert-Marie Lebourg) was educated at the École des Beaux Arts and the Académie de Peinture et de Dessin in Rouen, and later became a student at the studio of Jean-Paul Laurens (1838-1921) in Paris. Lebourg lived and worked for several years in Algeria, where he became a professor of art, and during which time his style became progressively more impressionistic. It was in Algiers that he refined his palette, honed his skills, and developed his signature style of harmonious colors displayed in the beautiful landscapes for which he is best known. He would paint many scenes in Algiers, as well as numerous French cities in Normandy and Auvergne. In the 1880s Lebourg exhibited at various exhibitions and salons alongside other famous artists including Claude Monet (1840-1926), Camille Pissarro (1830-1903), Edgar Degas (1834-1917), Georges Seurat (1859-1891), and Berthe Morisot (1841-1895). Throughout his career and posthumously, his work has been shown at institutions including the Musée des Beaux-Arts in Rouen, the Musée d'Orsay and the Petit-Palais in Paris. The present lot's autumnal shades and soft, broad brushwork perfectly exemplify Lebourg's Impressionist roots mixed with his adept ability to deftly compose the scene with a balance of light, shadow and color. Albert Lebourg (French 1849-1928) Route de village, Hondouville-sur-Iton Oil on canvas Signed lower right 37.5 x 64 cm. (14 3/4 x 25 1/4 in.) The authenticity of this work has been confirmed by Monsieur Francois Lespinasse. The French Impressionist and landscape painter Albert Lebourg was born on 1 February 1849, in Monfort-sur-Risle. Lebourg originally started his career as an architect, before becoming a student at the École des Beaux Arts et l¬ademie de Peinture et de Dessins in Rouen. After meeting the famous collector Lapelier in 1872, he taught drawing at the École Supérieure des Beaux-Arts in Algiers where he met Jean Seignemartin, a painter of the Lyon School. 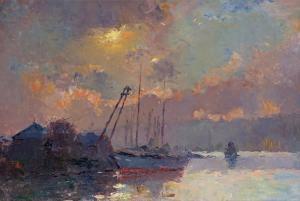 Under Seignemartin's influence, Lebourg's palette lightened and his paintings grew increasingly Impressionistic in style. In 1878, Lebourg returned to France and became a student at the studio of Jean Paul Laurens. 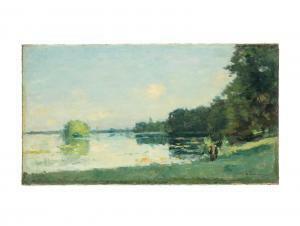 He first exhibited with Monet, Sisley, Renoir, and Pissarro on Montmartre Boulevard in 1878. 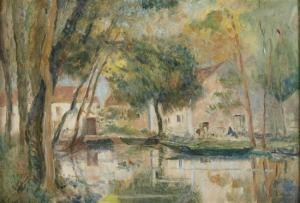 In 1893 Lebourg became a member of the Société des Artistes Français and painted mainly in Rouen and Auvergne, as well as along the banks of the Seine. He spent twelve years between 1895 and 1907 travelling aroun Europr including the Netherlands, England, Switzerland and Belgium. Lebourg's main 'Impressionistic subjects' were landscapes; he became fascinated by the different lighting conditions over the course of a day capturing the momentary and transient effect of sunlight in the open air (en plein air) rather than in a studio from sketches. This approach was influenced by Claude Monet and the circle of other Paris-based artists of the 1860s. Lebourgh had a retrospective of his work at the Galerie Georges Petit, Paris in 1918. Three years later in 1921, after a stroke which partially paralysed him, he ceased his career and moved back to Rouen where he died seven years later. The present work is a typical example of Lebourg\’s interplay between colour and light - it was painted in Hondouville-sur Iton, a small village between Louviers and Evreux (Eure) circa fifty kilometres from Rouen.